Just like humans, cats require a balanced diet. However, the bowls of dry kibble and water that many of us put out for our cats today are a far cry from our cats’ natural diet: Prey that’s high in protein, a moderate amount of fat, and low amounts of carbohydrates. Consequently, it’s important that our cats’ diets consist of all of the proteins, fats, carbohydrates, vitamins, minerals and water they need in the proper amounts. This is especially true if you have a special needs cat, since they have enough to worry about already. 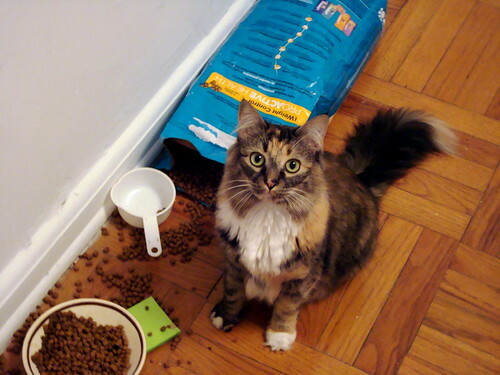 You can do this by making sure that you’re feeding your cat a high-quality cat food. If you’re unsure if your cat’s current food is meeting all of your his diet requirements, check with your vet to see what he suggests. The amount of food a cat requires as well as his nutritional needs can vary depending on his age, breed, gender, activity level, temperament, environment, and metabolism. Water is actually the most important nutrient for all pets. Water accounts for up to 70% of a cat’s body weight, and just a 10% decrease could result in serious illness. Unfortunately, cats don’t have a strong thirst drive, but there are things you can do to help make sure your cat is getting enough water. Proteins are the basic building blocks for the body and are essential for growth. Proteins are made up of amino acids; some of which a cat’s body can manufacture, others need to be supplemented by the cat’s diet, specifically from meat and plant sources. Generally, animal proteins (meats, by-products) have more of what cats need than vegetable proteins (like soybean or corn gluten meal). 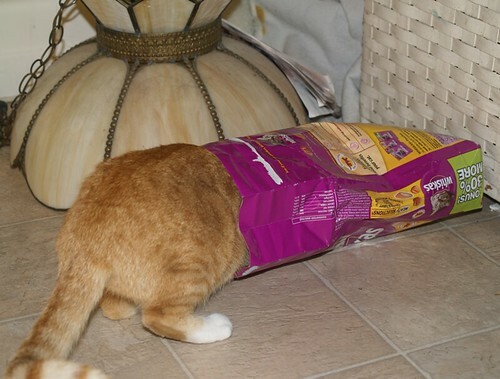 As we all could guess, cats require a high level of protein in their diets. If this level isn’t met, your cat’s body could start breaking down the protein in his own muscle to meet his needs. Fats are the most concentrated form of food energy – they have more than twice the energy of proteins or carbohydrates. They are essential for many roles: they are needed for the structure of cells; they play a part in the production of some hormones. Fats supply essential fatty acids, help our cats’ bodies absorb fat-soluble vitamins, help maintain a healthy skin and coat, and provide insulation for the body. They also make food tastier for our kitties, unfortunately a diet with too much fat in it may lead to weight gain. Carbohydrates provide energy for the body, as well as help with intestine and reproductive health. While there’s no minimum carb requirement, cats do need a certain level of glucose to supply energy to critical organs, like the brain. According to the Virginia-Maryland Regional College of Veterinary Medicine, cats are metabolically adapted for higher metabolism of proteins and lower utilization of carbohydrates than dogs or other omnivores. They go on to explain that while cats can use carbohydrates as a source of metabolic energy, they have a limited ability to spare protein utilization by using carbohydrates instead. Vitamins, Amino Acids, Minerals, Etc. Vitamin A (active form): The active form of Vitamin A helps convert beta-carotene to retinol. Without this, night blindness, stunted growth, and skin and coat problems can develop. Niacin: Cats’ bodies can’t manufacture niacin in sufficient quantities, so they need this to be supplemented in their diets. Without it, weight loss, inflamed gums, and bloody diarrhea can occur. Taurine: This is an essential amino acid that’s present only in animal tissues; if deficient, heart problems, eye conditions and reproductive issues could occur. Arginine: This amino acid is converted into another amino acid, ornithine, which is essential for the proper breakdown of protein. If there’s a deficiency of this amino acid, ammonia levels could rise in the body. Arachidonic Acid: Cat’s can’t produce this acid, so it’s necessary component to their diet. It assists in proper inflammatory response, blood clotting, and reproductive and gastrointestinal function.